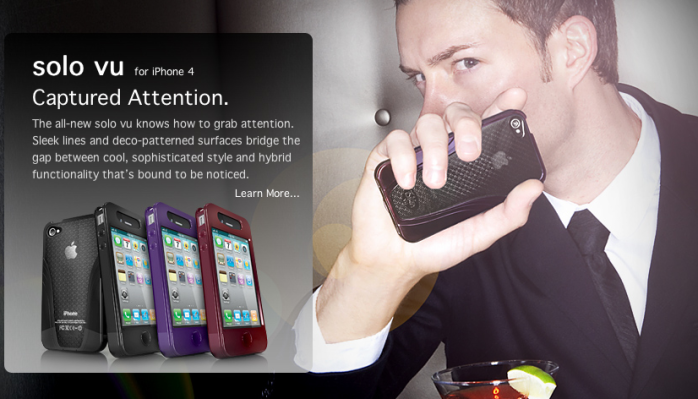 Such excitement coming from Canada today, iSkin's new Solo Vu cases for the iPhone 4 have been unveiled and we have some exclusive first looks at what's coming your way! The new iSkin Solo Vu for the iPhone 4 takes on a similar hybrid design and style as it's bigger brother, the Vu for the iPad. Similar to the new and just upcoming Solo FX for the iPhone 4, the Solo Vu has a big opening at the top so that you can easily slip in your iPhone 4 as well as extra front protection on top of the iPhone 4's glass screen. The Solo Vu offers some great protection thanks to it's hybrid design of mixed soft, flexible and hard materials. The Solo Vu for the iPhone 4 will be available in about two weeks from now so mark your iCals. You will be able to pick one of these in three colors for $39.99. Update: It looks like we're in luck, iSkin have confirmed that the Solo Vu will available to purchase and ship starting tomorrow.